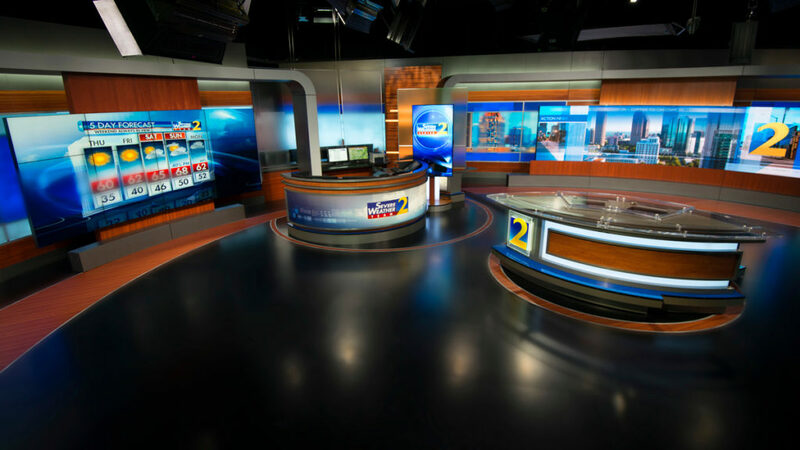 Cox Media Group’s WSB-TV debuted an expansive new set from Devlin Design Group in January that mixes traditional wood tones with plenty of technology to enhance storytelling. What were the goals / objectives of the redesign? The WSB team was very clear and focused when it came to identifying their goals and objectives. Where did the design draw inspiration? ‘Tradition’ is a word the WSB team does not use lightly, however, we also knew that they wanted something different. The Atlanta area is a mix of old and new. Through our many meetings with WSB we were able to realize their visions of a mix of tradition coupled with something truly unique and contemporary. 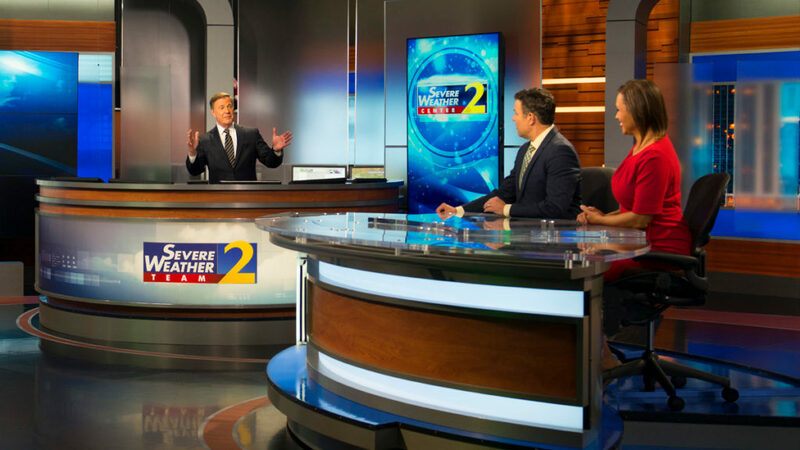 We were able to take all of the ideas and needs and create a scenic storytelling environment that was extremely useful, cost efficient, and most importantly, pleasing to the diverse Atlanta audience. How did you create a modern environment that still has warmth? In a world of design software and technology modeling tools, spontaneous freehand sketching was the most efficient and effective way to jump start the creative process between Team DDG and the WSB team. The final design is not only a canvas of the practical wants and considerations, the two teams also explored long-standing emotional connections to this well-known and highly respected station. This scenic storytelling environment is designed to engage and respond to the Atlanta audience. Team DDG’s challenge was to design for the future – in ways that make sense now. The result is a design full of new scenic storytelling environments and experiences, with an open door to future opportunities for bringing visual communication to life! 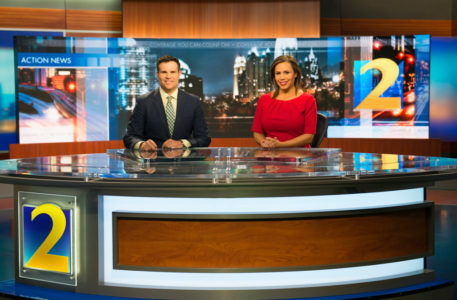 Talk about the challenges of incorporating items like a robotic track camera that you don’t often see in a local news studio? At Team DDG we are lucky to have the technical talent on staff in order to blend new technology with the design for a fully integrated result. Placing the track camera to maximize the shot potential, as opposed to finding a place so it ‘fits’ the studio is very challenging. With such an awesome piece of gear you want to make sure it can be used effectively throughout the newscast. What technology was used on the set? The centerpiece of the new design is a large 19.69’ x 4.92’ curved Leyard LED panel behind the anchors. The expansive weather center gives the entire weather team the high tech environment necessary for covering extreme weather events. Another notable part of the scenic design is dedicated to a number of moving monitors, allowing the ultimate in flexibility when it comes to visual storytelling. It’s sort of a storytelling ‘transformer’! There is a large rolling video kiosk that gives reporters a visual variety of storytelling options. 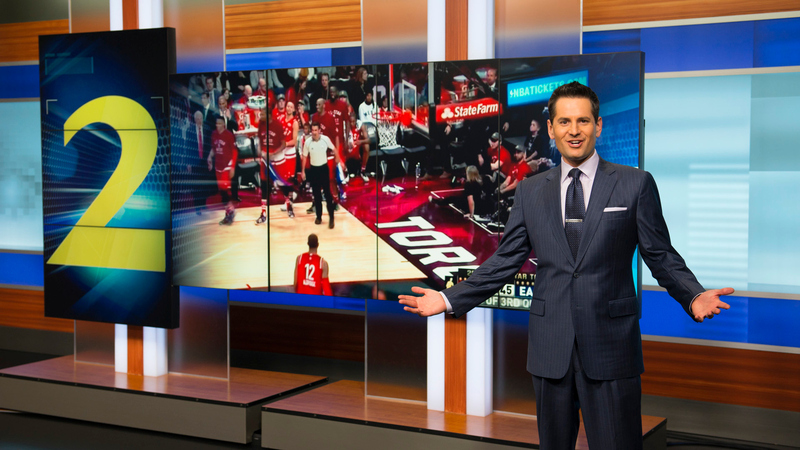 How do you see the potential for LED video walls in local news? We see a true desire for ‘seamless’ video in talks with our clients. The biggest factor preventing many local news stations from using this technology is cost. When costs come down I’m sure we will see more LED video walls on local sets.